Behind Every Activity We Do There Are Underlying Concepts. Children Look Forward To Fun Activities We Do On Daily Basis. Our Activities Are Saddled With Well Planned Value Education That Lead To The Growth And Development Of A Child. We Develop Listening Skills In Our Kids Through Well Designed Activities. 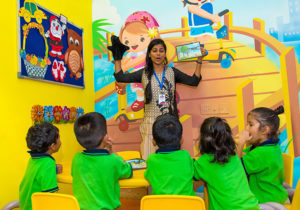 Children Listen To Sounds Of The Letters Of The Alphabet. We Ascribe Personality To Each Letter Of The Alphabet And Take Children Through The ‘City Of Alphabet’ Where Letters Talk Like Human Beings. 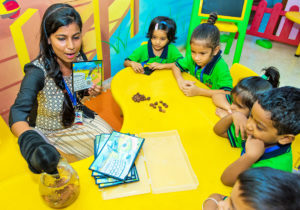 The Fantasies Created With This Method Motivate Children And Make Them Eager To Hear Stories About The Interactions Of Letters In The Imaginary ‘City Of Alphabet’ As Interesting Stories Are Told, Children’s Full Attention Is Captured And It Becomes Easy To Acquire Listening Skills. They Are Equally Exposed To Moral Building Stories That Help Them In Forming Distinct And Enviable Characters That Make Them Live Fulfilled Lives In Future And Be Of Tremendous Blessings To Their Communities And The World At Large. At The First Contact Of The Child With The School, We Work On The Fine Motor Skills To Ensure The Child Does Not Grow With Crude Spinster’s Grasp. This We Achieve Through Crafts And The Use Of Crayon In Coloring. It Helps In Training Of The Wrist To Make It Flexible For Writing. Kids Learn Different Colors. The Color Of The Week Is Chosen And Children Are Attracted To Objects With The Color Of The Week. Children Are Involved In Painting Of Objects, Using Plasticize, Dough Or Clay To Mould, Paper Collage, Construction Of Puppets To Mention A Few. We Recognize The Importance Of Music To Early Childhood Education. From The Time Immemorial, Music Has Been A Source Of Inspiration To Learning. Children Love Music And Concepts, Virtues, Culture Etc Are Easily Understood In Music. Early Childhood Is One Of The Best Periods When Music Aptitude Can Be Inculcated In Children. WOW KIDS Schools Use The Culture Of Music To Sensitize The Kids . Their Attention Are Easily Captured When They Listen To Music. Their Cultural Heritage Are Preserved In Music. More Importantly, Rhymes Are Learnt Through Music. Children Learn Better When They Explore. WOW KIDS Are Taken Through Learning Science By Exploring Their Environment. Our Reading Curriculum Gives Room For The Children To Learn Our To Use New Words. New Words To Learn On Daily / Weekly Basis Are Written Out On Cards. Our Maths Curriculum Is Very Rich Taking The Children Through Counting, Measuring, Identification And Patterns Creation. We Also Work On Developing Logical Reasoning Through Solving Simple But Highly Educative Puzzles. WOW KIDS Are Not Confined To Learning Within The Four Walls Of The School. They Go Out On Field Trips When The Need Arises. It Is Celebrations Galore At WOW KIDS Schools. We Celebrate Children’s Day, Tea Day, Community Day, Teacher’s Day, Colour Days, Zoo Day, Mother’s Day, Father’s Day, Green Earth Day,Children’s Day,Flower Day, Friendship Day, Road Safety Day, Market Day And Fruit Day. 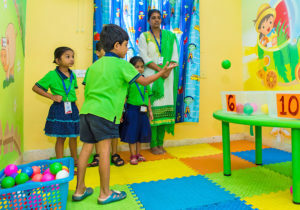 Children Are Allowed To Engage In Physical And Health Development Activities Like Sprinting, Throwing And Catching Balls, Picking Balls, Hide And Seek Game, Walking On A Straight Line, Walking Sideways And Backwards, Bending, Squatting Etc To Enable Them Acquire Psychomotor Skills.